Usually my family is steak purists. A good cut of beef, salt, pepper, and the grill. But sometimes that steak deserves an amazing sauce to go with it. This is one of those days. 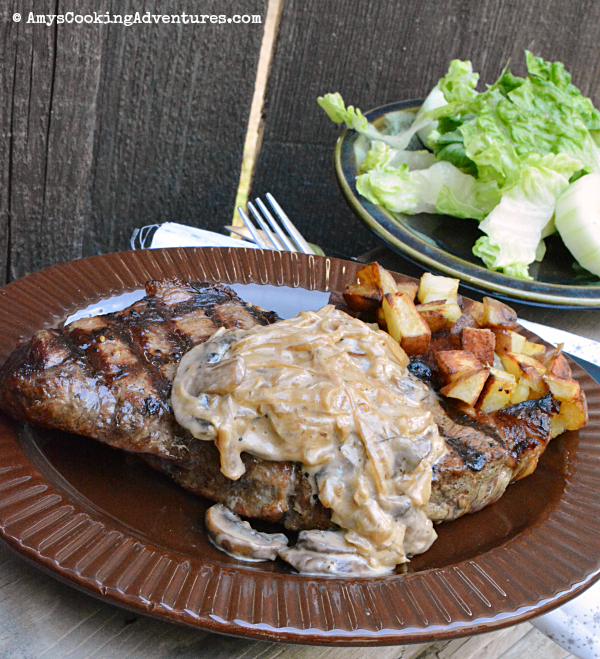 These steaks are topped with an amazing mixture of caramelized onions, mushrooms, cream, and a splash of bourbon, just because. It’s perfect for those days when you just feel like kicking the meal up a notch! Season the steaks with salt & pepper and grill to desired doneness. Melt the butter in a large skillet over medium-low heat. Add the onions and cook until softened and just beginning to caramelize, about 15 minutes. Add the mushrooms. Cook until the mushrooms are tender and all excess liquid had cooked off. Add the garlic and cook for about 30 seconds. Add the bourbon until the liquid cooks off. Stir in the heavy cream and cook until thickened, about 5 minutes. Season with salt and pepper and serve over steaks. 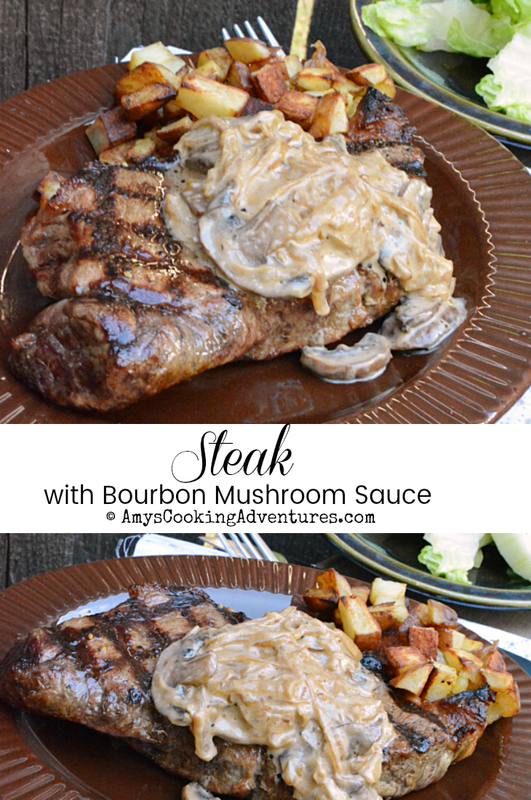 Steaks with Bourbon Mushroom Sauce are a great way to step up your grilling game! Season the steaks with salt & pepper and grill to desired doneness. Melt the butter in a large skillet over medium-low heat. Add the onions and cook until softened and just beginning to caramelize, about 15 minutes. Add the mushrooms. Cook until the mushrooms are tender and all excess liquid had cooked off. Add the garlic and cook for about 30 seconds. Add the bourbon until the liquid cooks off.Stir in the heavy cream and cook until thickened, about 5 minutes. 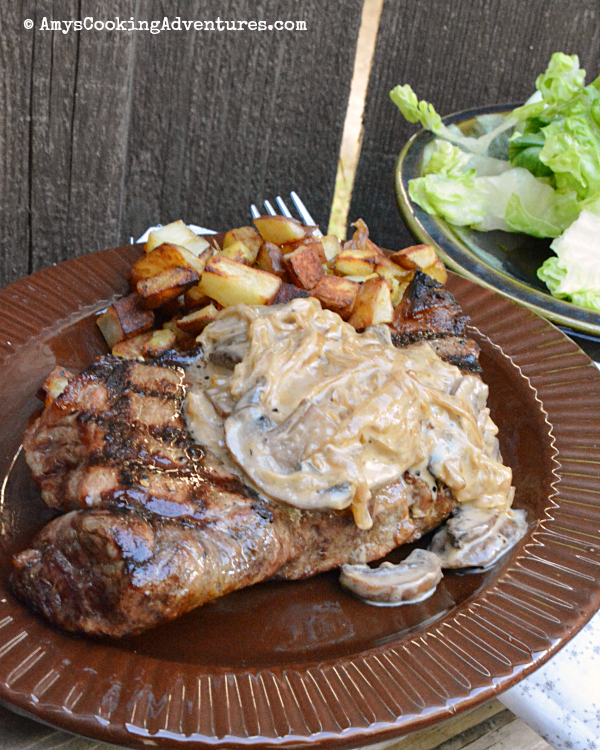 Season with salt and pepper and serve over steaks.